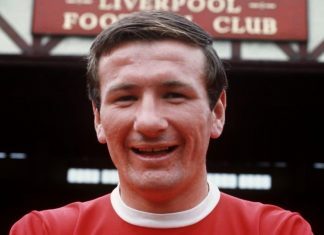 Liverpool legend Tommy Smith has died at the age of 74. For former Reds skipper had an 18-year career at Anfield, during which he won four league titles, and lifted the European Cup in 1977. “Dad died very peacefully in his sleep shortly after 4.30pm today at Green Heyes nursing home in Park Road, Waterloo, Crosby,” said his daughter, Janette Simpson. Tommy was a fan favourite, loved for his no nonsense approach to defending, one which earned him the nickname ‘The Anfield Iron’.